Being the Brit that he is, Ed Sheeran had never done Thanksgiving until this year. And the guy ended up doing two different dinners for the holiday—one at Jennifer Aniston's house and the other at Courteney Cox's! "I ate a lot of food, drank a lot of wine and played a lot of songs," said Sheeran, who has lived in Cox's Malibu beach house. "I didn't do [any music] at Jen's house, I just drank," he said. "Courteney set up like a PA system and I did a show there. It was very random. One of my all time favorite actors and comedians, Sacha Baron Cohen, was there and we ended up jamming and he like a rap in Arabic and stuff. It was very funny." Sheeran wasn't even supposed to be at Aniston's for her Thanksgiving get-together. "Then I turned up…and they're having a proper Thanksgiving meal and I'm there and I think I was wearing my board shorts or something. It was fun." "I like Thanksgiving," Sheeran said. "It's an excuse to spend time with your family and I think that's important." And a time to eat turkey. Sheeran smiled, "And cranberry sauce, stuffing and gravy." 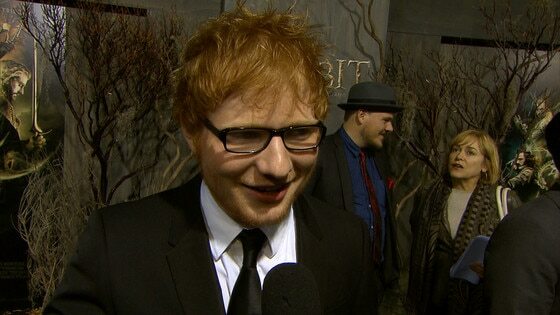 Check out more from the Hobbit premiere tonight on E! News at 7 p.m. and 11:30 p.m.